Of course I get stung-just not nearly as often as I used to- say 21 years ago when trying to maintain hundreds of “Killer Bee” hive boxes. I was introduced to the beekeeping industry in 1997 and loved every aspect of it (except the stings). However, the domestic bee population was rapidly changing with the growing infiltration of africanized honey bees. 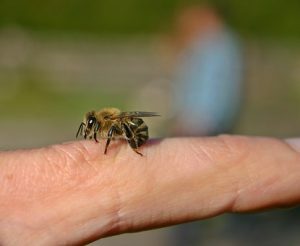 It became a challenge to maintain healthy hives in an urban setting and attempts to re-queen and “rehabilitate” these colonies became a constant battle. I realized that there was a growing need to offer expertise in dealing with these aggressive urban colonies, and I decided to offer a bee removal service to homeowners to assist in africanized bee removal including live swarm removal, bee control, hive removal and construction repairs. Twenty-one years later I still very much enjoy working with both the bees, as well as each and every customer I help. With every bee removal being completely different than the next it gives my work days lots of variety. I still get stung, and have been known to get a little jogging in from time to time fanning off bees, but am pleased to provide a service that offers protection to homeowners and their families.